Here is why your child needs to play youth football. Support the game, spread the word! According to the CDC (Center for Disease Control) more than a third of children and adolescents are overweight or obese. The main cause of childhood obesity is the food selection. Eating fast food for dinner is a lot more convenient that cooking at home. Overeating is another major problem since portion size and portion control are not monitored properly . Increased use of technology, such as video games, internet, and TV, complicates the matter further because it leads to physical inactivity. Playing youth football helps keep the children physically active so that they are better able to maintain a healthy body weight, and it will give your children something else to do besides video games and surfing the web. When playing youth football, children are in a safe and controlled environment with other children and away from otherwise bad influences. According to the OJJDP (Office of Juvenile Justice and Delinquency Prevention) most gang members join their gangs when they are between the ages of 12 and 15. Children involved in youth football will have positive role models and mentors who will in turn help keep kids away from the wrong crowd of people. According to childrensdefense.org, juveniles were responsible for 26 % of all arrest for property crimes. Youth football provides a positive activity for children to participate in during those crucial after school hours, so they are less likely to get into trouble. Football requires a lot of practice time. It also requires a commitment to physical fitness, skill development, learning plays and game planning. Youth football will also help a child develop positive work ethic. Developing a strong work ethic will better enable children to achieve their goals later in life. There is no sport that requires more resilience than football. During football games there are ups and downs. Things can go from very good to very bad all too fast. Being able to bounce back from adversity and setbacks shows a child’s resilience. Playing football well requires fighting through adversity and staying positive. Life is full of adversity and challenges. Here’s a great way to help children develop some “fight” and help to prepare them for their teen years and adulthood. A good youth football coach will be a positive influence on your child. A good coach will develop confidence in his players and keep the kids interested in playing the sport. Do not underestimate the positive influence a youth football coach can have. Having a good coach will be a positive role model for all players including those who might be considered “high risk” and will help keep them out of trouble. Game day is great family time. Athletes arrive in cars loaded with family and friends to root them on. The whole family can participate by supporting the individual and team, while enjoying being outdoors! Parents will talk to other parents and family members; and friendships are born. It is a true social event. Parents, other family members and friends are encouraged to come to games and support the team. Playing youth football will develop a great deal of self confidence in your child. As the skill level of the youth football player increases, so does the child’s self-confidence. Being a part of a team helps children create friends- which will help deter bullying in schools. Youth football promotes physical fitness, bullies will think twice about picking on a well conditioned football athlete. Read Youth Football Online All-Star Selection Harrison Bailey for a great example of how football helps to deter bullying. Football is a competitive sport. Playing youth football will encourage competitiveness in other areas of life. Players will have to compete in practice for playing time. Players will compete against other teams on game day. To be successful in life you need to be competitive. Being non-competitive often leads to underachievement, therefore football is good training for later in life. Coaches should encourage competitiveness and hard work. When a player works hard and competes they will be rewarded with playing time, regardless of their skill level. When you work hard and are competitive, good things happen. Football has many rules and requirements. With that said, youth football will help develop discipline in children. It will require children to work hard, be on time to practices and games, and play within the rules. It teaches the children follow directions and execute instructions given by authority figures. Football develops physical strength and agility, and a learning activity. 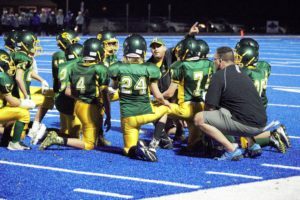 Youth football players will be required to remember plays during practices and games, they will have to absorb the instruction and then need to execute these instructions. Remembering the plays and game plans are a challenging task. The concentration it takes to learn X’s and O’s helps ‘train’ the mind and creates study discipline. Playing youth football is not only a physical activity! Physical activity is a healthy and natural way to relieve stress. It is the perfect activity for children if there is stress at home. We want our children’s lives to have as little stress as possible and to give them healthy and safe opportunities to relieve what stress they have. Consistent stress can only be bad. Youth football is a positive, safe, and controlled environment where children can vent and have fun. It is a positive way for a child to burn their energy which will allow them to be calmer and more in control when they are at home. A child who has an avenue to release stress, and burn excess energy, will be calmer, happier and more content at home. According to Dr. Mehmet Oz, “In the 12-17 age group, the average age of smokers first use is 15 years”. Once these kids start, they get hooked. Smoking while involved with grueling football practices and games is nearly impossible. It’s the number one reason why kids love to play youth football. It’s simply a lot of fun! Playing youth football has many benefits. No child should be deprived of these benefits because of financial struggles. With some funding and dynamic fundraising, youth football organizations can reduce, or eliminate, registration fees!